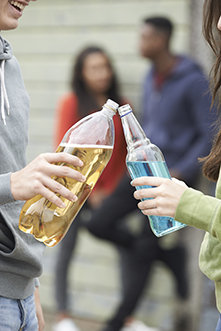 Summary: Substance use is common in children and youth. Primary care physicians can play a key role in promoting healthy behaviours – for example, the longer that a child/youth delays experimentation, the more their risk of substance abuse is reduced. Primary care physicians can also play a key role in early identification of substance use issues, and ensure that youth are referred to appropriate resources. Most adults who have substance abuse problems report that their problems started in youth. Since when did the substance use start? Any problems caused by the substance use? Stages of change -- does the patient believe there is a problem? What is patient's stage of change? Substance use disorder in DSM-5 combines the DSM-IV categories of substance abuse and substance dependence into a single disorder measured on a continuum from mild to severe. Development of withdrawal symptoms, which can be relieved by taking more of the substance. Recurrent substance use resulting in a failure to fulfill major role obligations at work, school, or home (such as repeated absences or poor work performance related to substance use; substance-related absences, suspensions, or expulsions from school; or neglect of children or household). Continued substance use despite having persistent or recurrent social or interpersonal problems caused or exacerbated by the effects of the substance (for example, arguments with spouse about consequences of intoxication and physical fights). Note: The symptoms for abuse have never met the criteria for dependence for this class of substance. According to the DSM-IV, a person can be abusing a substance or dependent on a substance but not both at the same time. Tolerance, as defined by either of the following: (a) A need for markedly increased amounts of the substance to achieve intoxication or the desired effect or (b) Markedly diminished effect with continued use of the same amount of the substance. Withdrawal, as manifested by either of the following: (a) The characteristic withdrawal syndrome for the substance or (b) The same (or closely related) substance is taken to relieve or avoid withdrawal symptoms. The substance is often taken in larger amounts or over a longer period than intended. There is a persistent desire or unsuccessful efforts to cut down or control substance use. A great deal of time is spent in activities necessary to obtain the substance, use the substance, or recover from its effects. Important social, occupational, or recreational activities are given up or reduced because of substance use. The substance use is continued despite knowledge of having a persistent physical or psychological problem that is likely to have been caused or exacerbated by the substance (for example, current cocaine use despite recognition of cocaine-induced depression or continued drinking despite recognition that an ulcer was made worse by alcohol consumption). American Academy of Paediatrics (AAP) does not recommend routine testing for drug use in children and adolescents in a primary care office, unless part of a comprehensive treatment plan that involves addictions specialists. Reference: Knight JR, Mears CJ, for the Committee on Substance Abuse and Council on School Health, American Academy of Pediatrics. Testing for drugs of abuse in children and adolescents: addendum—testing in schools and at home. Pediatrics. 2007;119:627–30. Health care professional can educate about the risks of such behaviors. Professional: “I know that as a teen, you want to fit in with your peers / feel better / cope with stress / etc." There are no medications that can treat substance use per se. There are medications however, that may be useful if there are problems with withdrawal syndromes. Bukstein OG, Bernet W, Arnold V, Beitchman J, Shaw J, Benson RS, et al., for the Work Group on Quality Issues. Practice parameter for the assessment and treatment of children and adolescents with substance use disorders. J Am Acad Child Adolesc Psychiatry. 2005;44:609–21. Youth-friendly website with information about the dangers of drugs, designed to empower youth so that they can make healthy decisions. Excellent website with a wealth of information and materials about specific drugs (cannabis, cocaine, ecstasy, etc. ), as well as advice for parents on how to connect with their kids and keep them safe from drugs. Handout for patients with information about opioid medications. Branch of the U.S. Department of Health and Human Services that is charged with improving the quality and availability of prevention, treatment, and treatment of substance abuse and mental illness. Website has a great wealth of information as well as downloadable pamphlets. This is a website for both youth and youth workers. For youth, the website provides information about substance use. For youth workers, the web site is to act as a participant resource for relevant materials that were covered during the Substance Use Awareness and Youth Engagement program to support those who work with youth to engage in conversations about the prevention of illicit substance use. The Alcohol Risk Assessment and Intervention Project of the College of Family Physicians of Canada has developed materials and training for family physicians to use in helping their patients reduce the risks of alcohol-related harm. Practical reference is for primary care health providers who have patients with substance use problems. Based on current clinical evidence and the extensive clinical experience of the editors and contributors, the toolkit provides brief answers to common clinical questions, as well as relevant clinical tools and patient resources. There are currently no letters attached to this article.